As of 25th January 2016 we can present our modern and innovative >stockbig® plaster and mortar machines in our newly-opened, 200m² showroom at our branch in Siek (near Hamburg). From the classic >stockbig No.1 to the new >stockbig No. 3 Mixer plus - a variety of our machines is on display as well as there being a demonstration area with an adjacent conference room. >stockbig® the quality brand for plaster and mortar machines from STOCK – B.I.G. GmbH will be presenting its newest products and services at the beginning of March at their booth: HALLE A1.530. The "FAF" is THE trade fair for paint, construction and facades and takes place every three years in Munich or Cologne. This year's trade fair in Munich is expecting up to 50,000 visitors to over 450 exhibitors from home and abroad. At the FAF trade fair in Munich >stockbig® will be presenting the further development of the successful No. 3.
weighting in at only ----kg it can be used almost anywhere! At this trade fair the quality brand presented the >stockbig No. 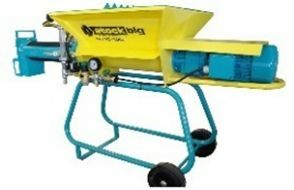 1 plastering machine which can be used with bagged materials or with a >stockbig® SiloBooster conveying system. Together with products from Rokamat the international fair visitors were shown special machines for dry walling. An excess of 480 exhibitors and 20.000 visitors from this field found their way to Beirut and to the building trade fair for the Lebanon and Middle East.